Globally the conservation of endangered species is an ongoing crisis. As the field expands new points of conflict arise, that between Orca and fishermen is one such conflict. Depredation of fisherman’s catch and the competition for similar fish stocks have generated conflict between earth’s two top predators. Orca are present globally, and eat many key fishery species hence are dependant on many of the same fish stocks as fishermen. Conservation efforts since the 1950s have seen whales return to high populations in the 20th century for the first time since the onset of modern intensive fishing 1. Interactions interrupt what many fishermen conceive as their generational right or economic viability 2, more often orca are put at risk. Depredation is the removal of fish from hooks as they are hauled up by fishermen. Orca can follow specific boats for days 2, waiting for them to drop lines and bring up lunch. This primarily impacts longline fisheries around Patagonia, South Georgia-Antarctica, Alaska, Canada and the Strait of Gibraltar. These areas mark where pods of Orca are resident and notable fisheries exist 3. Some of these fisheries include Bluefin Tuna, Halibut and Patagonian Toothfish. Note how each is a significant economic resource 2. Scientific studies have noted a trend between depredation and higher calf survival in Orca1,3,4. At a basic level the fisheries provide food for the orca that normally they could not collect so easily. 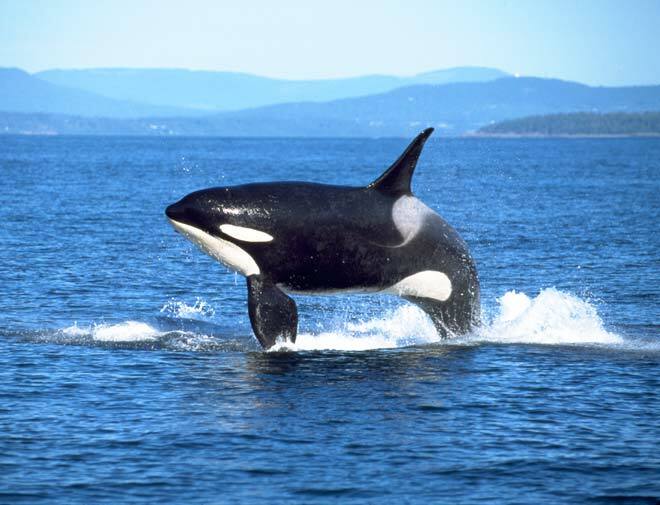 Depredation rates vary from around 50% – 80% of a fisherman’s catch on any given day the orca are following a boat 3. Firstly this represents a large proportion of food made available to orca and consequently a significant loss to fishermen. In the Strait of Gibraltar R. Esteban et al. found depredating pods to have a greater ability to rear calves, with a total of 13 calves over the study period compared to the two managed by non depredating pods 1. The greater survival rates in these calves was attributed to food availability. However depredation poses two key risks to Orca those being aggression from fishermen/ the use of lethal methods to keep Orca away and overfishing of their primary food source. Orca and illegal fisherman interactions in the Crozet islands between 1996 and 2002 caused a 60% decline in the orca population 4. For a large slow breeding specie such dramatic decrease takes years to recover from. Marine predators are most sensitive to changes in fish abundance when prey abundance is low 1. Orca have only recently attained stable populations in many regions since conservation efforts begun. Such populations of are still at risk due to human exploitation of their food source. 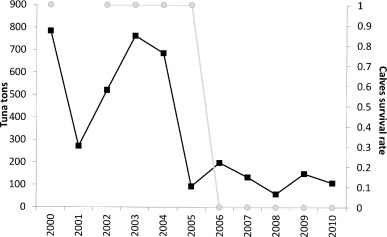 A prime example being the same gibraltar pods, Fig 1 shows the dramatic drop on calf survival rate a year after the collapse of the tuna population. No calf in either the depredating or non depredating pods survived 1. The Fisherman v. Orca conflict outlines two contrasting values those being economic gain and conservation. As animals are brought back from the brink a new phase begins many people neglect, these animals will continue to interact with us. Orca are one of the few species to win a “battle” with humans, can they keep going? R. Esteban, P. Verborgh P. Gauffier, J. Giménez, C. Guinet, R. Stephanis, Dynamics of killer whale, bluefin tuna and human fisheries in the Strait of Gibraltar. Biological Conservation 2016. 194: p. 31-38. M. J. Peterson, F. Mueter, D. Hanselman, C. Lunsford, C. Matkin and H. Fearnbach, Killer whale (Orcinus orca) depredation effects on catch rates of six groundfish species: implications for commercial longline fisheries in Alaska. ICES Journal of Marine Science, 2013. 70(6), p. 1220–1232. Tixier, C. Barbraud, D. Pardo, N. Gasco, G. Duhamel and C. Guinet Demographic consequences of fisheries interaction within a killer whale (Orcinus orca) population. Marine Biology, 2017. 164(170).